Memorabilia tracing the mining history of a South West valley is being sought to celebrate its history. Oral history tapes, photographs, maps, postcards, artefacts and other written material about the Tamar Valley will be put together in a major archive. 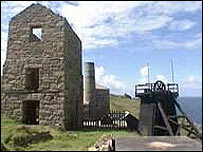 History societies, museums, libraries and residents are being targeted by the Tamar Valley Mining Heritage Project. The project will also include market gardening, churches and chapels, fishing, transport and local customs. The project's main aim is to ensure the valley's mining engine houses, water wheels, chimneys, mines and quaysides are looked after for people to enjoy. A Memory Tea Shop event is planned for late March to encourage older residents to share their memories. It is hoped that future areas of study will include refugees, the emigration of miners to Australia, South Africa, India and America.